The site map on the Site Center allows you to add new sections and pages to your site. Click Add New button to see your choices. 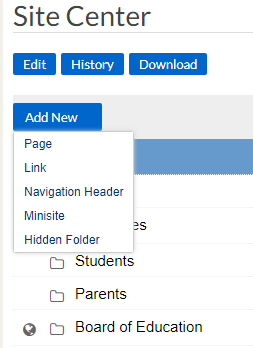 Your options for new pages include title, short URL, location in the map, and the layout of the page. Links appear like pages in the navigation menu but link the user to another site. The options include the title, URL of the destination, to open in a new window, and the location in the map. 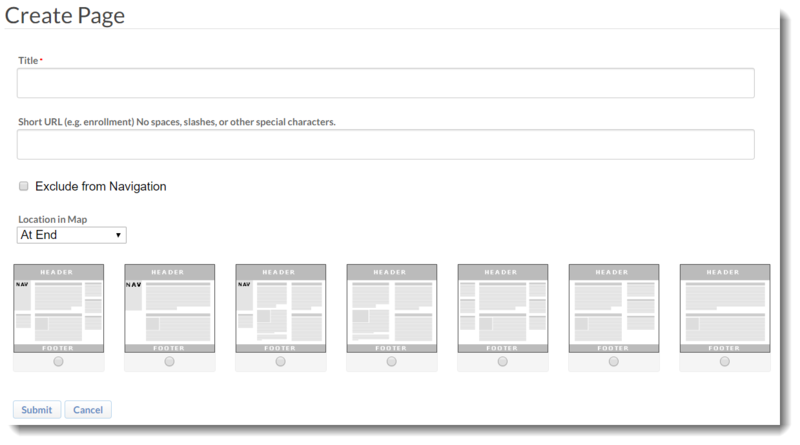 These sections are for organizing your site. They may contain pages and other sections, but you cannot assign editor and contributor rights to the pages within a navigation header. Your options are the title and location in the map. Like navigation headers, minisites may contain pages and other sections, but you can assign rights to the pages within. Minisites may also include their own news and events. The options are name/title, require a login (private sections), and location in the map. As the name suggests, these sections and the pages within are hidden from the navigation menu. The only options are the title and location in the map.